Many people who are not from the southeastern and southcentral regions of United States first think of pecan pie when they think of the drupe. Pecans (Carya illinoinensis) are one of the most recently domesticated major crops. Native North America, 80 to 95 percent of the world’s production of pecans are produced in the United States. The edible portion of pecans are not technically a nut but a drupe, because it contains a single stone or pit surrounded by a husk. Pecans are edible in both the raw and roasted forms. Many people who are not from the southeastern and southcentral regions of United States first think of pecan pie when they think of the drupe. However, the pecan a delicacy for many culinary dishes. 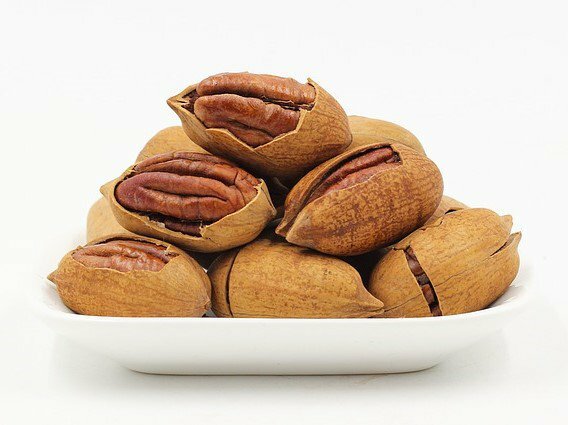 Here are the seven health benefits of pecans. 1. Pecans are an excellent source of antioxidants. Antioxidants are vital for the health of the cell and body by neutralizing highly reactive harmful chemicals called free radicals. High oxidative stress from free radicals have been linked to human diseases like arthritis, vasculitis, glomerulonephritis, lupus erythematosus, adult respiratory diseases syndrome, heart diseases, stroke, intestinal ischemia, hemochromatosis, acquired immunodeficiency syndrome, emphysema, organ transplantation, gastric ulcers, hypertension, preeclampsia, Alzheimer's disease, Parkinson's disease, muscular dystrophy, alcoholism, and smoking-related diseases. 2. Pecans could help you with your diabetes treatment. Recent research suggested that eating drupes like pecans may reduce the risk of type 2 diabetes. A Nurses’ Health Study categorized pecans as nuts. In their study, they found that women below the BMI of 25 had a 45 percent reduced the risk of type 2 diabetes when they are nuts five times or more per week. However, more research needs to be conducted. The Iowa Women’s Health Study found that postmenopausal women who ate nuts had no reduced risk of diabetes compared to women who ate nuts occasionally after adjusting for multiple confounders. 3. Pecans can help promote a healthy heart. Pecans may help decrease your risk of coronary heart disease. Coronary heart disease, or ischemic heart disease, is a group of illnesses that include the following: stable angina, unstable angina, heart attack, and sudden cardiac death. The antioxidants like vitamin E and ellagic acid help protect the heart from cellular damage due to free radicals. In a pooled analysis of four studies, researchers found that people with the highest drupe consumption have a 37 percent reduced risk of fatal coronary heart disease. In the Physicians’ Health Study, researchers found an inverse correlation between drupe consumption and overall coronary heart disease death rate. 4. Pecans may help prevent total bone loss in postmenopausal women. Pecans are rich in mineral like manganese, copper, and zinc, all which are vital for healthy bones. Studies have suggested that women with osteoporosis have decreased plasma or serum levels of manganese and an enhanced plasma response to an oral dose of manganese. The studies suggest a link between low manganese levels and osteoporosis in women. 5. Pecans may reduce your risk of developing gallstones. Gallstones as solid pieces of material that form in your gallbladder and block your bile duct. They are painful if you develop them and must remove the stones immediately. Two kinds of gallstones may occur. Cholesterol stones represent 80 percent of the gallstones and are a yellowish-green. Pigment stones are smaller and darker than cholesterol stones but are made up of bilirubin. Tsai et al. 2004 found that a high drupe diet is linked to the reduced risk of developing gallstones. Their logic stemmed from other research that suggests the high unsaturated fatty acids and low saturated and trans- fatty acid profiles protected the body against cholesterol gallstone formation. Monounsaturated and polyunsaturated fats may inhibit cholesterol cholelithiasis. 6. Pecans may help the symptoms of PMS. The high manganese content in pecans may women boost their moods and decrease pain symptoms during their premenstrual syndrome. 7. Pecans could help you manage your weight. Pecans may be rich in fat, but they are also loaded with protein and fiber, which can contribute to making you feel fuller for longer times. Feeling full longer can help you crave less for other high-calorie foods. Stefanis, L., Burke, R. E., & Greene, L. A. (1997). Apoptosis in neurodegenerative disorders. Current opinion in neurology, 10(4), 299-305. Jiang, R., Manson, J. E., Stampfer, M. J., Liu, S., Willett, W. C., & Hu, F. B. (2003). Nut and peanut butter consumption and risk of type 2 diabetes in women. Obstetrical & gynecological survey, 58(4), 258-259. Parker, E. D., Harnack, L. J., & Folsom, A. R. (2003). Nut Consumption and Risk of Type 2 Diabetes—Reply. Jama, 290(1), 38-39. Fraser, G. E., Sabate, J., Beeson, W. L., & Strahan, T. M. (1992). A possible protective effect of nut consumption on risk of coronary heart disease: the Adventist Health Study. Archives of Internal medicine, 152(7), 1416-1424. Hu, F. B., Stampfer, M. J., Manson, J. E., Rimm, E. B., Colditz, G. A., Rosner, B. A., ... & Willett, W. C. (1998). Frequent nut consumption and risk of coronary heart disease in women: prospective cohort study. Bmj, 317(7169), 1341-1345. Kushi, L. H., Folsom, A. R., Prineas, R. J., Mink, P. J., Wu, Y., & Bostick, R. M. (1996). Dietary antioxidant vitamins and death from coronary heart disease in postmenopausal women. New England Journal of Medicine, 334(18), 1156-1162. Albert, C. M., Gaziano, J. M., Willett, W. C., & Manson, J. E. (2002). Nut consumption and decreased risk of sudden cardiac death in the Physicians' Health Study. Archives of internal medicine, 162(12), 1382-1387. Kelly, J. H., & Sabaté, J. (2006). Nuts and coronary heart disease: an epidemiological perspective. British Journal of Nutrition, 96(S2), S61-S67. Freeland-Graves, J., & Llanes, C. (1994). Models to study manganese deficiency. Manganese in health and disease, 59. Reginster, J. Y., Strause, L. G., Saltman, P., & Franchimont, P. (1988). Trace elements and postmenopausal osteoporosis: a preliminary report of decreased serum manganese. Medical Science Research, 16, 337-338. Cohen, B. I., Mosbach, E. H., Ayyad, N., Miki, S., & McSherry, C. K. (1992). Dietary fat and fatty acids modulate cholesterol cholelithiasis in the hamster. Lipids, 27(7), 526-532. Ayyad, N., Cohen, B. I., Ohshima, A., & Mosbach, E. H. (1996). Prevention of cholesterol cholelithiasis by dietary unsaturated fats in hormone-treated female hamsters. Lipids, 31(7), 721-727. Jonnalagadda, S. S., Trautwein, E. A., & Hayes, K. C. (1995). Dietary fats rich in saturated fatty acids (12∶ 0, 14∶ 0, and 16∶ 0) enhance gallstone formation relative to monounsaturated fat (18∶ 1) in cholesterol-fed hamsters. Lipids, 30(5), 415-424. Penland, J. G., & Johnson, P. E. (1993). Dietary calcium and manganese effects on menstrual cycle symptoms. American journal of obstetrics and gynecology, 168(5), 1417-1423.